Dec - 30 | By: zikri | 2 comments. 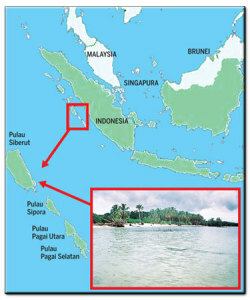 Siberut Island (4.030 km sq) is the largest island of four islands in the Mentawaian archipelago. It is located about 155 kilometers of West Sumatra coast, across the Mentawaian strait. 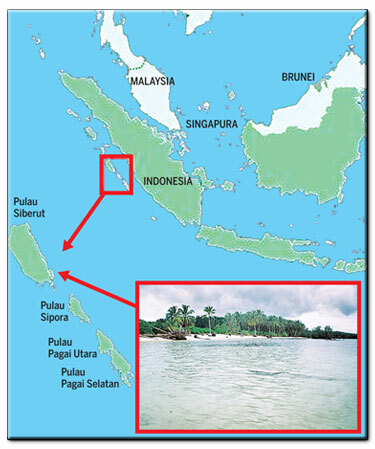 The Mentawaian islands belong administratively to Padang Pariaman Regency in West Sumatra Province. Siberut is divided into two districts: North and South Siberut with administrative centers at Muara Sikabaluan and Muara Siberut which also service as respectively market centers of Siberut. We can meet the indigenous Mentawai people who live close to nature and still live in comparative isolation, maintaining their age-old ways. Its virgin rainforest, is inhabited by a number of animal species that cannot found anywhere else in the world, among them some rare monkey species, pleasant surprises wait to explore. The island also offers continuous spectacular white sand beaches with shallow shelves jutting out to the sea and fringing coral reefs, excellent for snorkeling and leisure a luxury for most of the islanders. It can only be found a few coastal communities. We will be rewarded with stunning views and beautiful jungles abounding with unique plant and wildlife. The real highlight of our journey though, is the chance to meet the Siberut people, traditionally hunter, gatherer clans who are now coming into contact with the modern world. We will stay as guests of a local Kerei (medicine -man) in the Uma (traditional family house). Here, where conditions are basic, we will gain a unique insight into the lives of these people who maintain a belief system based on living in total harmony with nature. Siberut island recently received international attention as a priority conservation area, for the unique culture of the ethnic Mentawaian and endemic of its biodiversity that need to be preserved. Although the island has plenty to offer, the potential has not been utilized fully especially for tourism. Most visitors to the island are only interested to see the culture at the indigenous tribes, such as the communal clan life in the traditional UMA house along the riverbanks. Siberut National Park occupies the western half of the island, ranging from the northern coasts. At present the Integrated Biodiversity Conservation Project organized by PHPA, MOF, together with local government, local NGOs and other institutions, conducts the community based conservation program. Siberut Island is characterized by a wet equatorial climate, with minimum and maximum temperatures of 22o C (71.6F) and 31o C (87.8F). The dry season is from February to June and the raining season is from July to January. Siberut is hilly with wide variations in elevation. Almost 60% is covered by tropical rain forest with many forest types such as: primary dipterocarp forest, primary mixed forest, swamps forest, Barrington forest and mangrove forest. Also, there are many rivers on the islands with a complex system of tributaries. Although Siberut is only a small island, the internal variations in language, culture, life styles, and in resources is rather substantial. There is no clear indication of when the first man arrived on Siberut, but anthropologists suggest that the bataks of North Sumatra first settled on the island several thousand years ago. In many ways, the Siberut people are among the most archaic people in Indonesia. The Mentawaian are traditionally organized as matrilineal groups and the social life centered around the UMA, a communal long house which held a clan of people related through a common ancestor. The UMA vary in size between 30 to 80 members divided in nuclear family units, referred to as LALEP. Because of internal friction, the clan might split up and form a new group or a single family. The Mentawaians believe that all living objects, men, plants and animals are supposed to have spirits. The only specialist in the community is the medicine man, KEREI, responsible for communication with the spirits and the souls. In case of misfortune or illness, he is called in to restore harmony within the group or in relation with the spirits in the environment. An elaborate Taboo system based on religious beliefs with respect to the environment is a dominant characteristic of traditional life on Siberut. Visit and stay in a Mentawaian village, trek to the jungle, learn about sago processing and bark cloth processing, and do other activities that will heighten our interest in and fascination with the natural philosophy of the Mentawaians. Very few visitors have explored the thickly forested island. Visiting a cave in central Siberut or waterfalls in the northern and southern parts of the island, are possible upon request with our guide. Be observant of our surroundings. We may have the chance to see and hear some endemic wild life. Siberut has four endemic primates that in local names are called Bilou (Hylobates klossi), Simakobu (Simias concolor), Bokoi (Macaca pagensis), and Joja (Presbytis potenziani). There are at least five species of squirrels and chipmunks and birds abound everywhere on the island. Padding a canoe trekking on muddy trails balancing on a shipper log, wading through a shallow river, brushing through a dense jungle – are all parts of an unforgettable jungle adventure on Siberut. Some good coral reefs can be found along the east, south to southeast part of Siberut and the surrounding small islands. Along the coast, continuous, white sand beaches, magnificent lagoons, enfacing mangroves and Coral Sea gardens all promise an exciting coastal adventure. Dolphins (Stenela longirostris) can be seen along the east coast. Other sea mammals such as digong (Dugong dugong) occasionally can be sighted near the sea grass by the mangrove along with three protected species of sea turtles. A motorized boat can reach Masilok Beach on the southern part of Siberut within an hour. The island’s resort, dominated by coconut grows, a lagoon with beautiful white sand beach, promising a very relaxing environment. The west coast breaks from Siberut Island, connected only by sea garden and mangrove that lie side-by-side making it a unique experience for diving. Accommodation and fresh clean water are available. If we plan to travel to nearby islands, it can be arranged with local owners. In the southwestern part of Siberut lies Sagulubek Beach, with calm and clear waters making it ideal for wind surfing. In the northern part, Sikabaluan beach offers an excellent dip in warm water to soothe the soul. From Padang City as capital province of West Sumatra, after that go to the Padang Port by public transportation: bus or taxi, available taxi as well, take a ferry from the port with the range price between 110.000 – 150.000 rupiah, with destination to Siberut Island directly. Leaving Butui, one of the better accessible settlements of the Mentawai on Siberut Island. The Mentawai people never wear shoes but we-the people who cannot walk-need such aids, and many more. A handrail along the slippery tree trunk, for instance, to facilitate access to the house and to leave it, especially at night when somebody had to follow the call of nature. Tree trunks are very often laid on muddy trails, where the mud can get quite deep. Good balancing skills are required on them, especially on round, slippery bamboo. One plus: falling in the mud does not hurt! Rivers cannot be followed all the time, and hills in between can be quite steep. They can be better walked uphill than downhill, for us with sticks as walking and balancing aids. Left lane for overtaking!! Trees had been felled by the local people to grow bananas, and are now part of the trail. Three of the 21 Mentawai porters we had hired to carry the food for eight days as well as luggage. Mud walk. Here the ‘normal’ forest mud, greyish and odorless, but very sticky and difficult to walk with shoes. Lunch break during a seven-hour trek. Food is always being shared, but most important is that everybody gets a portion of tobacco. Cigarettes are fuel for the Mentawai people. Mud walk, here in a sago area. This mud is less dense, has a reddish-brown colour and smells of fermented sago. As with the Inuit who have many different words for snow we try to figure out how many words the Mentawai have for mud. The generic word ‘lati’ has been one of the first Mentawai words we have learnt. Beauty contest after a sago mud walk. We sometimes face the dilemna between balancing on a tree trunk and going through the mud. As shown above, mud can get quite deep. Two persons were necessary to free our fellow traveler from the mud trap, and they had to be very careful not to slip and get stuck themselves. The river between Atabai and Butui had swollen due to heavy rains and some passages could not be negociated without getting totally wet. Backpacks had to be passed over heads, and a ‘bridge’ made of round, slippery bamboo to be put across for the sikerei, who felt safer at balancing on it than at swimming.